As Expo 2015 kicked off in Milan last Friday, let’s explore a few unconventional ways to visit and enjoy this exciting city. Best known as Italy’s capital of business, fashion and design, few visitors (and even Italians) know that Milan was once also the country’s capital, in 286 AD, more precisely. Besides its most famous landmarks and futuristic projects, the city is also full of history and hidden treasures. Milan is probably also the most European of the Italian cities, with its seven universities and 120,000 students of which 50% are foreigners. Expo 2015, with as theme “Feeding the Planet, Energy for Life”, will run through October 31 and draw an estimated 24 million visitors to the city. So, we’d like to show you a few alternative ways to visit Milan’s famous landmarks, and take you to some meaningful symbols of the city and unusual areas you’ve probably never heard of. 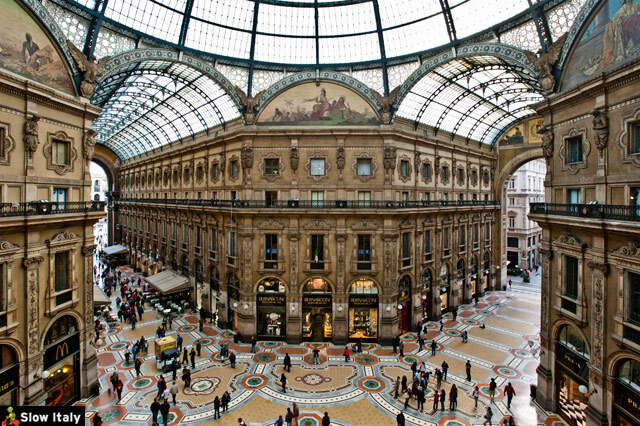 Galleria Vittorio Emanuele II is probably the only famous city landmark that was designed to connect two other landmarks, the Duomo and the La Scala theater. Few visitors who walk through the beautiful gallery realize that they are setting foot in the world’s oldest purposely-built shopping mall. The gallery is also the first Italian building entirely made of iron, glass and steel, an avant-garde concept at the time when it was built, that was later copied in other parts of Italy, the US and Canada. The central octagonal floor mosaic represents allegories of the four continents (Asia, Africa, Europe and America) and the coat of arms of the four cities that were the capital of Italy for a brief or longer moment in history (Milan, Turin, Florence and Rome). The coat of arms of Turin represents a bull. Legend has it that it brings luck if you rotate on one foot, with closed eyes, on the bull’s private parts. However, some say it only works if you do it at midnight on December 31! Turin’s Bull, central mosaic of Galleria Vittorio Emanuele. Photo (left) © emurtola. Photo (right) © cronopios. 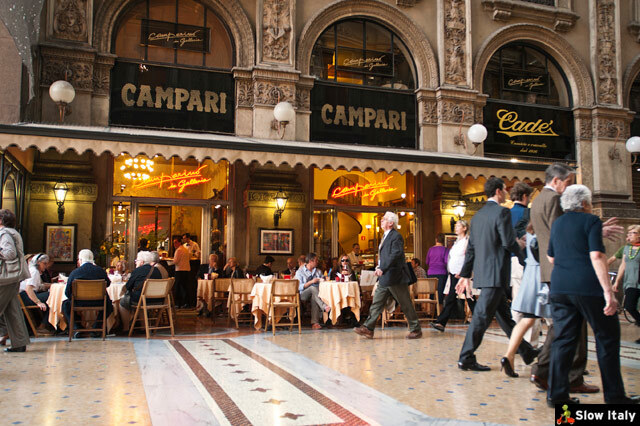 Tip: Have a drink at Caffè Zucca, one of the top 15 historic cafes of Italy, founded in 1867, or at Caffè Camparino (founded in 1915) another iconic cafe of Milan. Caffè Camparino, Milano. Photo © befa. Milan being Milan, its bakeries follow the same codes as the fashion industry, integrating chic and style in its (many) conceptual bakery shops and their prime products. Princi Bakery is one of these conceptual bakeries. 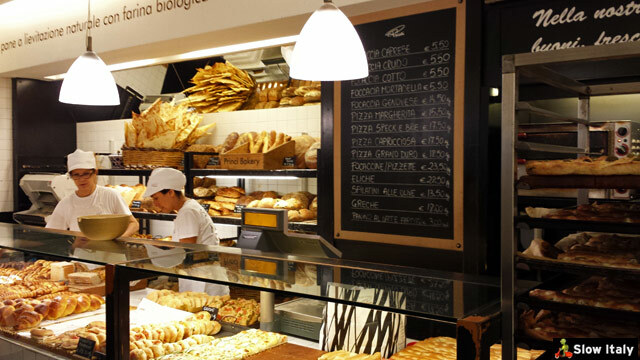 The first Princi bakery opened in Milan in 1985, as the brainchild of Rocco Princi, affectionately dubbed the “Armani of bread” by the press. He created a new concept of a chic bar-bakery in black and grey colors, open around the clock, where you can eat freshly baked products coming literally right out of the beech-fired oven. The delicious prime products (pastries, tarts, cakes, breads) are prepared following traditional recipes based on organic whole-wheat flour. As the idea is to serve breads and pastries right from the oven to the clients, the lay-out and design of the shops hardly make any distinction between the workshop and shopping area. 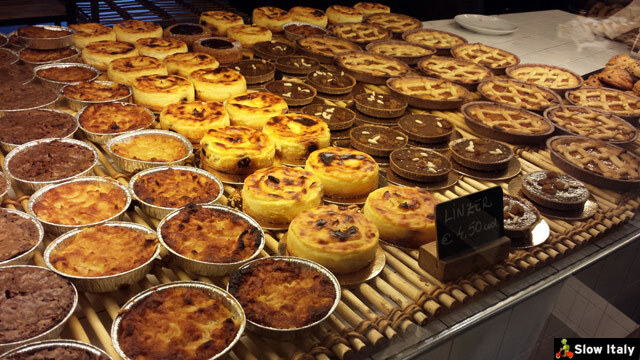 We visited the Princi Bakeries at Largo La Foppa and in Piazza XXV Aprile, 5. The nice thing about the bakery in Piazza XXV Aprile is that there is plenty of place to sit inside, while at Largo La Foppa you can only sit outside. Tip: definitely try the brioche alla ricotta, small fagotino al cioccolato, the cheesecake with ricotta and amarene and the small apple pie. Milan’s cathedral (duomo) with on the left the entrance to Galleria Vittorio Emanuele. Photo © elisalocci. Milan’s cathedral in Candoglia marble is the second largest catholic cathedral in the world and counts more statues than any other cathedral in the world: 2,300 external statues alone and 3,400 statues in total, representing a total weight of 325,000 tons! Even more astonishing is the surprisingly consistent result, considering that the project took more than 520 years to complete! Actually, when the Milanese talk about a task that will take ages to complete they say that “it takes as long as the construction of the Duomo”. Tip: it is worth seeing the Duomo also form the side, from Piazza Reale, and from the rear, from Corso Vittorio Emanuele, a view that was often represented in 19th century paintings. The best moment to view the Duomo is in the late afternoon with the setting sun. Another interesting view over the Duomo can be seen from the nearby Museo del Novecento, or from the 7th and top floor of the Rinascente (rebuilt in 1950), the famous Italian department store, where “Il Bar” offers an unusual view over the Duomo. View over the Duomo from the Rinascente. Photo by JasonParis. After a visit to the top terrace on the Duomo’s roof from where you can admire one of the most stunning views of Milan, head to Corso Vittorio Emanuele II. 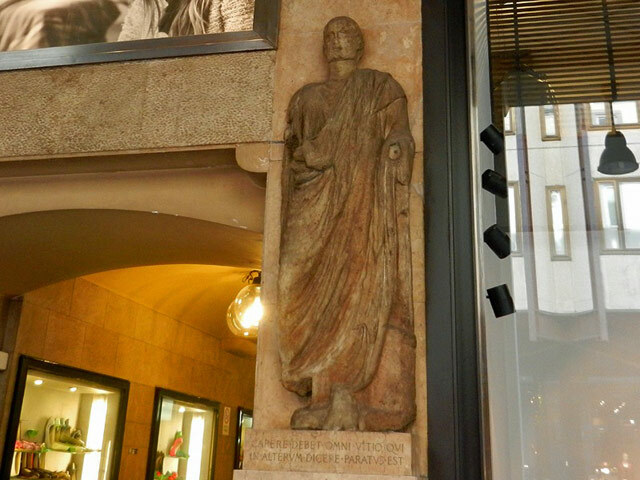 At number 13, under the arcades, in a niche, is a stone statue of a noble Roman in a toga. 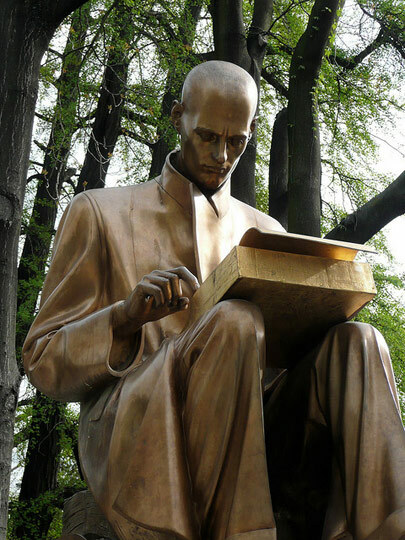 His head has been replaced with one representing the 10th century archbishop Adelmanno Menclozzi, who defended the plebs from abuse by the powerful. Known as Omm de Preja (stone man) or scior Carèra (Mister Carera), the statue was used as a bulletin board for satirical political messages, much in the same way as were the “Talking Statues” in Rome. Scior Carera. Photo by Geobia. Behind the Duomo is Piazza Mercanti, which was the center of Milano from 1233 until 1776. 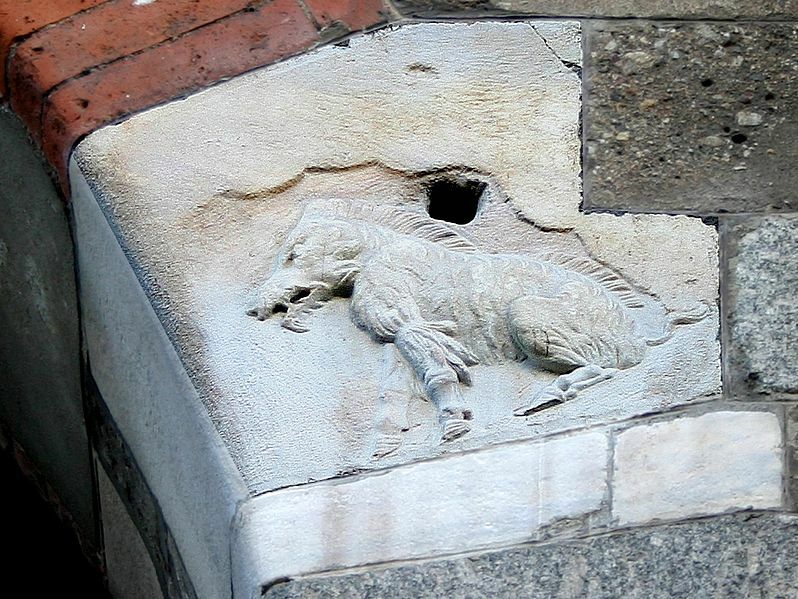 The square holds a small, but meaningful symbol of the city, the semi-long-haired sow (scrofa mediolanuta), depicted on a bas-relief on one of the capitals of Palazzo della Ragione. Similarly to the she-wolf of Rome, the long-haired sow is associated with the creation of Milan. 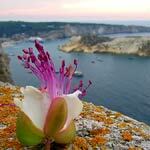 According to the legend, the Celt Belloveso saw the scrofa mediolanuta on the place where he would found the city. Presumably, it is from mediolanuta that the original name of Milan, Mediolanum was derived. However, the true etomology of the name is still a matter of conjecture. A meaningful symbol of the city, the Srofa mediolanuta (semilong-haired sow). Photo by G.dallorto. Via Montenapoleone, Milan. Photo © Moohoow. You might wonder what the link is between Milan’s fashion district and the Sforza Castle (Castello Sforzesco). Most people associate Milan with its fashion district, the famous Quadrilatero della moda, named after the four main shopping streets that form the sides of the rectangle: Via Montenapoleone (one of the top ten most luxurious shopping streets in the world), Via Manzoni, Via della Spiga, and Corso Venezia. 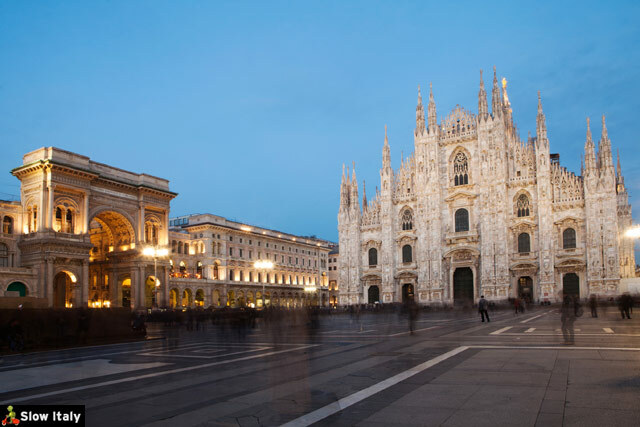 However, few know that Milan’s fame as the city at the forefront of fashion and design is in fact centuries old. Sforza Castle, Milan. Stock photo © repistu. Indeed, as early as the 1480s the Court of Milan played a leading role at European level in the art of jewelry, fashion, interior decorating and arts. Beatrice d’Este, Ludovico Sforza’s spouse, was one of the most refined and cultured princesses of Renaissance Italy, who appreciated the company of artists and intellectuals, among whom Leonardo da Vinci, Bramante and Amadeo. She was a kind of trend-setter, known for her good taste and for inventing new clothing styles, at a time when the Court of Florence promoted a much more austere style. Unfortunately, her court was short-lived (she died aged 22 after only 6 years of marriage), but among the most sophisticated and splendid of that time at European level. 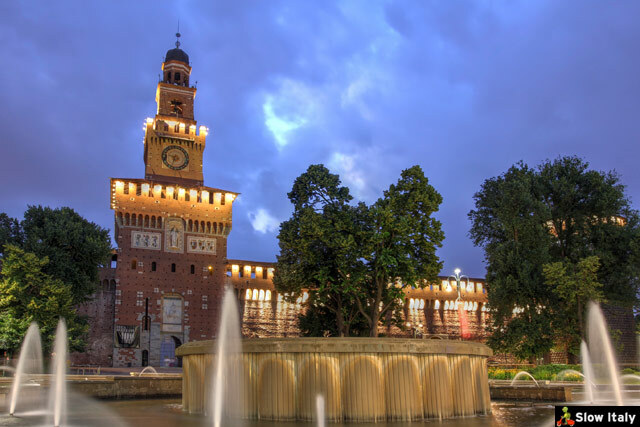 Today, the Sforza Castle is probably the only testimony of the Milanese Renaissance period still standing. 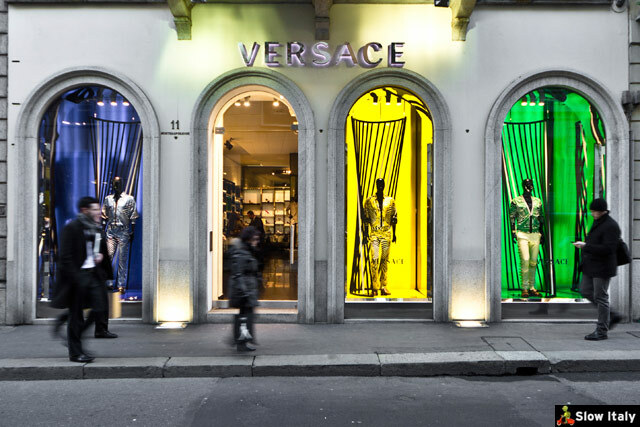 Tips: for more affordable shopping head to Corso Vittorio Emanuele II where you’ll find numerous shops and low cost department stores, as well as the famous shopping mall “Rinascente”. Another shopping area is Via Paolo Sarpi and Via Canonica, Milan’s Chinatown, with artist’s shops and generally lower priced quality products. There’s also Corso Buones Aires, similar to London’s Oxford Street, and last but not least, the Brera district, but more about the latter in the next point. The Brera district is an inspiring and trendy area of Milan, where you find designer shops, smart boutiques and lively bars and restaurants. The district includes Via Brera, Via Solferino, Via San Marco, Via Pontaccio, Via Madonnina and the streets in between. Two of my favorites are Angela Caputi, selling dazzling design resin jewelry in Via Madonnina 11 and Blue Deep, in Via Solferino 5, a SoHo-like clothing shop offering a wide collection of unique dresses, skirts, coats, and leather jackets at reasonable prices. 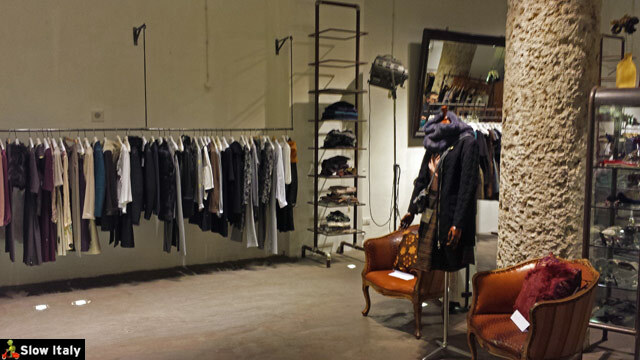 Blue Deep boutique in the Brera district. One of my favorites! Photo © Slow Italy. Also in the Brera district is the Pinacoteca di Brera, housed in the Palazzo di Brera: the greatest painting gallery of Northern Italy with more than 600 works from the Lombard and Venetian schools on display, including masterpieces by Raphael, Caravaggio and Piero della Francesca, among others. A market selling refined and often valuable objects is held in the Brera district every third Sunday of the month from 9:00 to 18:00. Tip: From Via Pontaccio you may want to proceed strolling along Corso Garibaldi up to Piazza XXV Aprile, for a beautiful walk. We already mentioned that Leonardo da Vinci was invited at the Court of Milan by the cultured Beatrice d’Este, who appreciated the company of artists and intellectuals. Leonardo da Vinci and architect Donato Bramante were among the many artists invited to the Court of Milan to make Milan one of the most splendid cities of Italy. The Tuscan artist and inventor spent more than 20 years in the Lombard city. He arrived in the city in 1482 or 1483 when the Court of Milan was at its highest splendor. 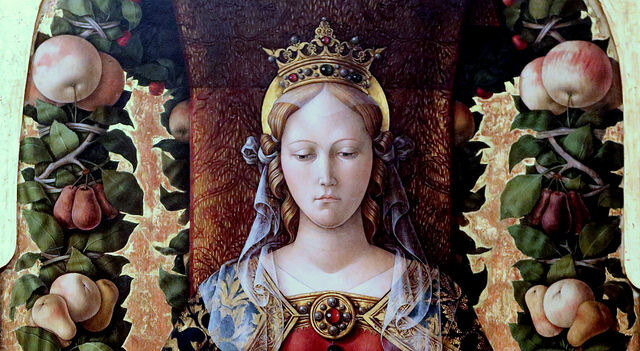 Under the auspices of Beatrice d’Este and her husband Ludovico Sforza magnificent works were created, the silk and metal industry flourished, the streets were widened, the cathedral further worked on and the university of Milan expanded. 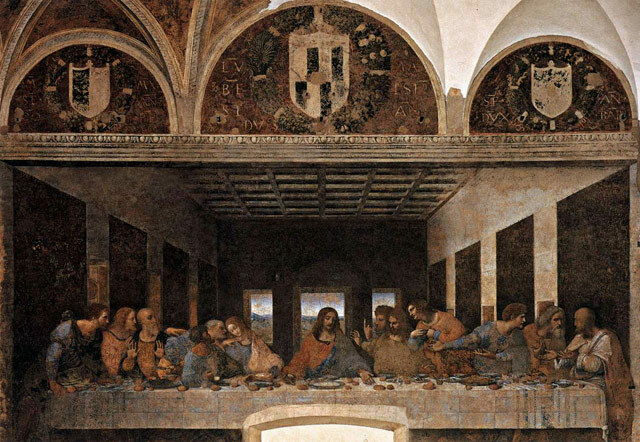 Leonardo da Vinci painted the Last Supper (L’Ultima Cena, 1494-1498) in the former refectory (cenacolo) of the monastery of Basilica Santuario di Santa Maria delle Grazie. It is a miracle that this masterpiece survived to this day as most of the church housing the fresco was destroyed by a bomb in august 1943. The church contained another masterpiece, Titian’s “Crowning of thorns”, which was taken by the French in the late 18th century and is now exhibited in the Louvre in Paris. Another architectural gem from the Renaissance period, which is often overlooked, is the church Santa Maria presso San Satiro, built between 1476 and 1486, with an impressive trompe-l’oeil by Donato Bramante. As space was limited due to the presence of the main road, the choir was truncated and replaced with a painted perspective, which makes the choir seem much more profound when viewed from the nave than it is in reality. This faux perspective created by Bramante was one of first examples of trompe l’oeil in the history of art. Bramante was one of the designers of St Peter’s Cathedral. 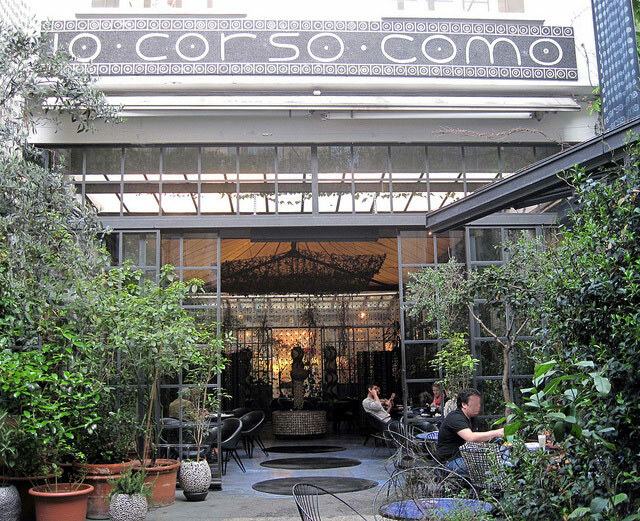 10 Corso Como concept store. Photo by thinkretail. There is also a small boutique hotel called “3 Rooms” with, as you’ve probably already guessed, just three rooms, but with a nice garden and terrace. Milan is one of the major Liberty style cities of Italy, together with Torino and Palermo. The Milanese Liberty style, which lasted from the beginning of the 1900s until the beginning of WWI, evolved from a floral style into a more eclectic style. Palazzo Berri-Meregalli, Milano. Photo © Filippo Bianchi. Reproduced with kind permission of Filippo Bianchi. 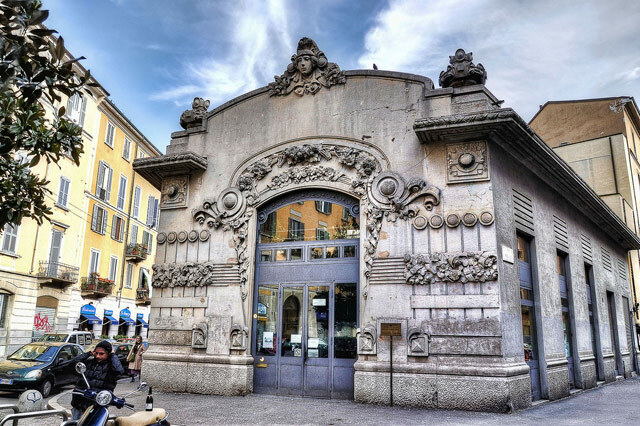 Most Liberty style buildings can be found in the district Porta Venezia, between Corso Venezia and Corso Monforte and Corso Venezia and Viale Majno, and between Corso Magenta and Parco Sempione. 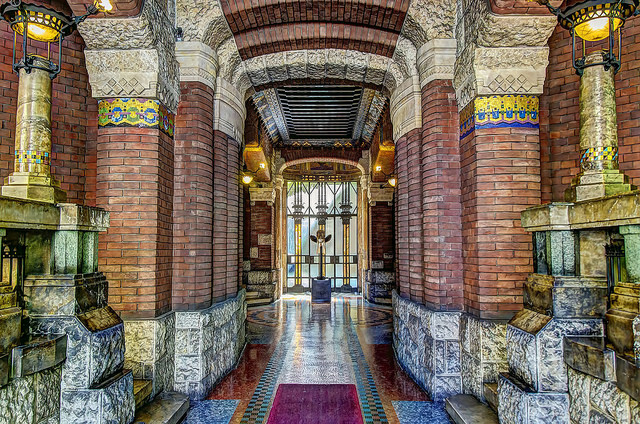 One of the first Liberty buildings in Milan, Palazzo Castiglioni by G. Sommaruga (1900-1914), can be found at no 47 on Corso Venezia. Worth seeing are also Palazzo Berri-Meregalli by G.U. Arata (1913-1914), in Via Cappuccini 8, Casa Galimberti by G.B. Bossi (1903-1904), in Via Malpighi 3 and Casa Guazzoni, a bit further at number 12 in the same street. Liberty-style cinema Dumont, at the angle of Via Melzo and Via Frisi, once the oldest cinema of Milan, is now a library. Unfortunately part of the building was destroyed by the original owners in the ‘80s, but the inhabitants of the district managed to save the building from further destruction, turning the building into the Biblioteca Comunale Venezia in 2001. Skip the usual Parco Sempione and head to Parco Indro Montanelli instead. Formerly known as Giardini Pubblici and Giardini di Porta Venezia, this historic city park (the oldest public park of the city, actually) close to Porta Nuova was named after the famous Italian journalist and writer Indro Montanelli who used to come for a walk here. Indro Montanelli statue in Parco Indro Montanelli. 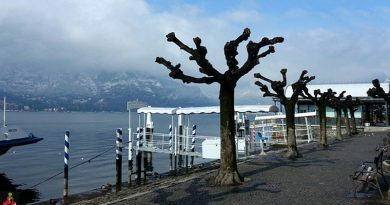 Photo by Jean-Marc Linder. Montanelli was one of the most talented Italian journalists famous for his use of a direct and plain written language. A famous history writer, he was often compared to Denis Mack Smith or even Hemingway for his “cronache dal fronte finlandese”, his war chronicles on the Finnish front during World War II. The parc covers an area of 17 hectares, including a Neo-classic section (towards Corso Venezia) designed by Piermarini (1783-1786) and an English-style garden (1857-1881). The gardens house the Planetario and the Museo Civico di Storia Naturale, one of the leading museums of natural history in Europe, featuring stuffed animals, fossils, minerals and dinosaur skeletons and stuffed specimen of extinct animals. Each year in May, Parco Indro Montanelli hosts the elegant Orticola market-fair, featuring antique roses and beautiful ornamental plants. 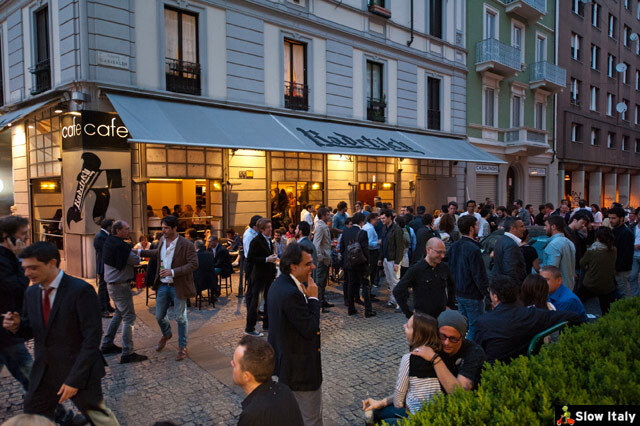 Close by the Parco Indro Montanelli is a nice place where to have a chic and cool aperitif with stuzzichini (appetizers), at La Terrazza di Via Palestro, a panoramic salotto with views over the Park. Radetzky caffè. Photo © befa. Two among the trendiest places for an aperitif are Radetzky caffè in Corso Garibaldi (frequented by designers, models, photographers, architects, and business people, after all when you are in Milan…) and the bar at Bulgari hotel. The latter has a beautiful courtyard, making it one of the most romantic and trendy places in town for an aperitif. 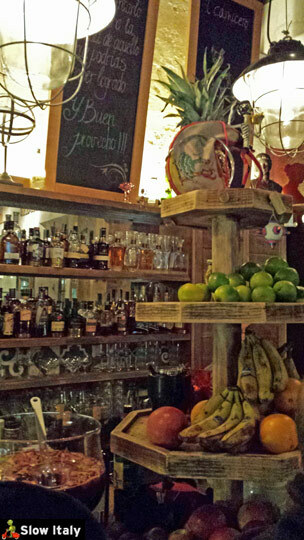 Prices are in line with the sophistication of the place, but drinks come with a myriad of delicious appetizers. Waiters keep refilling your plate on demand, so, for the busy and smart travelers, this aperitivo may be a clever alternative to dining out. 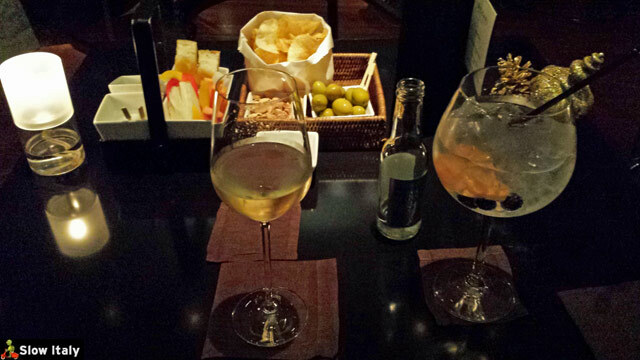 Count around 22 euro per drink (including the assortment of appetizers). Aperitif at the Bulgari Hotel. Photo © Slow Italy. Tip: for more casual places with a more laid-back atmosphere head to the Brera district and Corso Como, or to the area by the Colonne di San Lorenzo. Navigli, Milano. Stock photo © repistu. Just like Venice, Milan used to be a navigable city with an intricate system of canals that once were the city’s main means for trade and supplying food and goods. 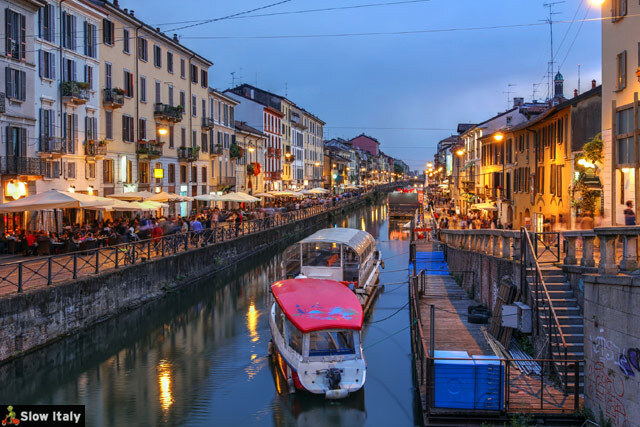 Many of the canals have been covered, but in the South-west area of Milan you can still see the Naviglio Pavese and the Naviglio Grande, giving birth to Milan’s most offbeat and trendiest districts, with pubs, restaurants and hip shops. The Naviglio Grande, the oldest of the two, is also the oldest navigable canal in Europe, dating back to the 13th century. It still features the traditional low-rise period buildings and numerous pubs and restaurants. 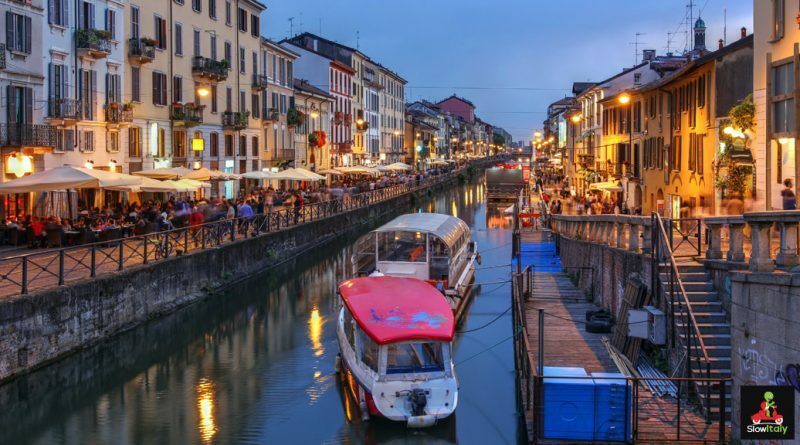 The Navigli also host the most ancient flea market of the city, the Fiera di Sinigalia, which takes place on Ripa di Porta Ticinese every Saturday from 8:00 to 18:00. On the first Sunday of June there is also the Festa dei Navigli celebrating the beginning of summer with a lively street event, featuring street artists, live music and many artisan stalls. Housed in what was once a local garage, the restaurant El Carnicero via Spartaco 31. has a contemporary and hip, yet cozy atmosphere. Relatively new on the trendy Milanese dining scene, this restaurant is a must try if you are looking for top notch (Argentinean) meat. We especially recommend the “Tomahawk” of about 1kg, a tender and very tasteful piece of meat. For amateurs of filet pur there is the “Lomo” of 1,300 kg (an entire filet pur). As antipasto we recommend the Pata negra (2 types, cured for either 24 months or 36 months). The isola district is a historic quarter between Via De Castillia and Via Confalonieri in the Porta Nuova area that is completely different from the other parts of Milan. This peculiar area, popular among locals, but relatively unknown to tourists, was until recently separated from the rest of the city by the railway, hence it’s name meaning ‘island’. 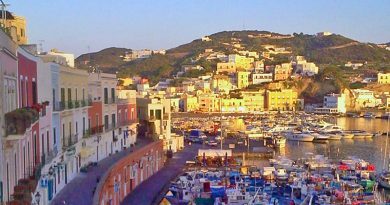 Because it was cut off for so long, the neighborhood retained cool village-like atmosphere, with small shops and local trattorie, organic delis, trendy boutiques and night bars. The area is also famous for its interesting street art. Bosco Verticale, the iconic towers in the Isola district. Photo by Lorenzoclick. The building of the iconic Bosco Verticale, two residential skyscraper towers housing 900 tree species, recently participated in a revival effort of the area. 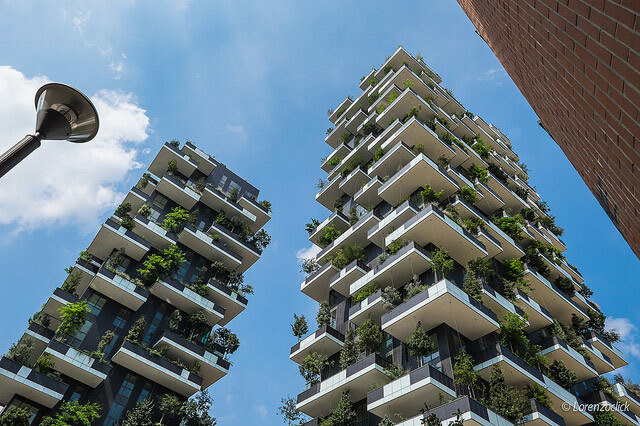 The green towers, designed by Stefano Boeri, Gianandrea Barreca and Giovanni La Varra, involving also several several horticulturalists and botanists were inaugurated in 2014 and won the award of the world’s most beautiful skyscraper in 2014. Tip: Blu ristorante is a cool place for aperitif, lunch or dinner, while Ceresio 7 (the former headquarter of Enel) is a trendy place for an aperitif on a roof top terrace overlooking 2 pools. Close by is also Piazza Gae Aulenti. Piazza Gae Aulenti. Photo by Stefano Bertolotti. 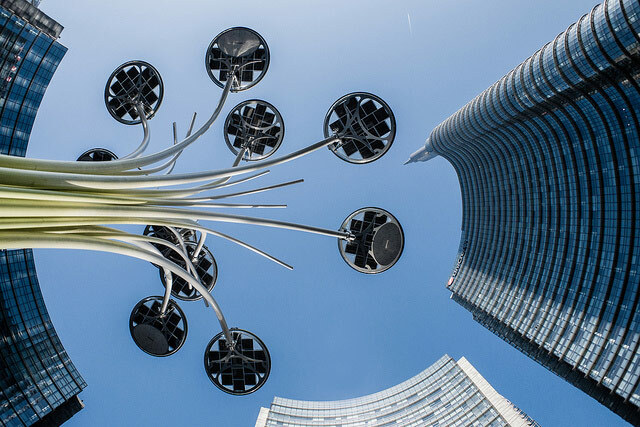 Piazza Gae Aulenti is a lively, futuristic neighborhood with the iconic Unicredit tower (231m high, highest building in Italy), designed by the architect Cesar Pelli. 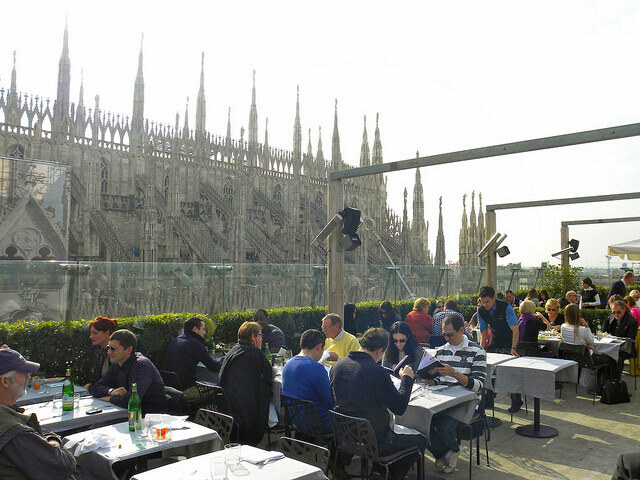 From the Piazza you can enjoy a wonderful panoramic view of the skyline of Milan. I know, I know, Sorbillo is Neapolitan, not Milanese, but if you have never been to Naples, this is your next-best opportunity to try the real, authentic pizza, as it is made by the best Neapolitan master pizzaioli. The pizzeria opened in October 2014 and when we visited less than a month later, in early November 2014, word-of-mouth had already translated into long queues outside the restaurant. Needless to say, the pizza is really worth the waiting. Tip: as a starter I recommend the Mezza Bufala (half a mozzarella, but of ½ kg (! ), so fit for 2 persons). Also try the Palla di Riso Bianca & Rossa (the famous Arancini served with delicious vegetable Tempura). It’s not Milanese, but it’s a must! 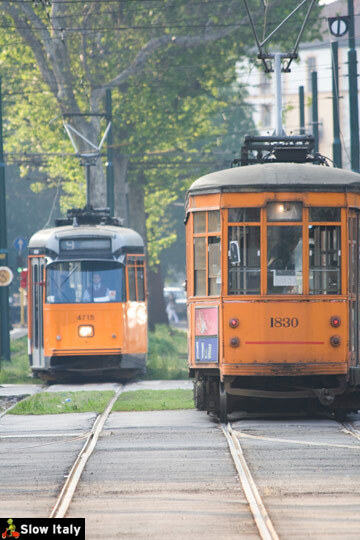 One of the best ways to pick up the flavor of Milan is probably to tour the city in one of the original 1900s trams that are still in use. Take the numero 1 on Piazza della Scala and do the entire tour until the Arco della Pace. Ossobuco with risotto. Photo © Slow Italy. 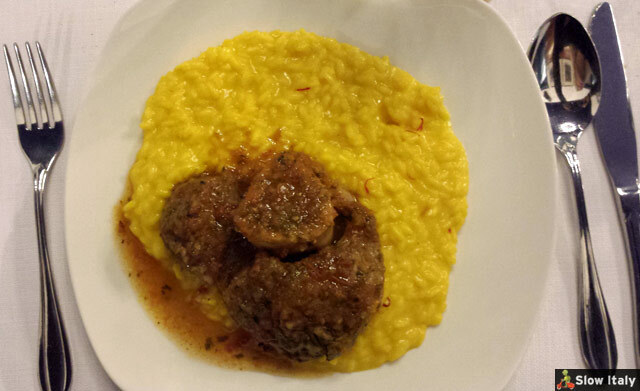 Two of the most famous Milanese flagship dishes are the risotto alla Milanese (a saffron infused risotto) and the Ossobuco, recipients of the DE.co (Denominazione Comunale, or Municipal Denomination) and, of course, the famous Cotoletta alla Milanese. The Ossobuco dish is a slow cooking dish par excellence as the braised veal shanks should be cooked very slowly so as to keep the marrow intact inside the hole and render the meat as tender as possible. Note that in Milan the Ossobuco is served as a piatto unico (main dish together with a primo, or carbo sidedish, which is rather unusual in the rest of Italy). Trattoria Masuelli San Marco, Viale Umbria 80, Milano. Photo © Slow Italy. One of our favorite places to enjoy typical Milanese cuisine a bit outside the usual tourist tracks (ssshhh don’t tell anyone!) 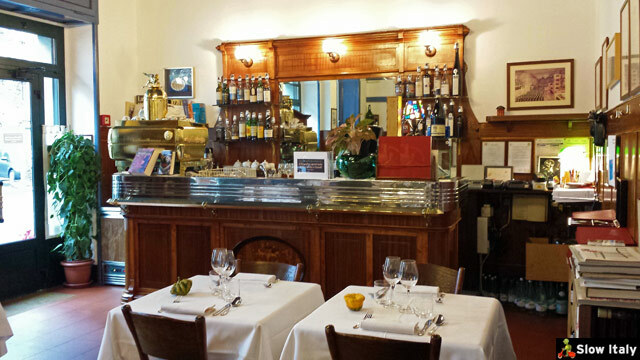 is Trattoria Masuelli San Marco in Viale Umbria 80, which has existed since 1921. The 3rd generation now manages the kitchen, while the son of the original founder is still attending the tables. Tip: also try the Börroeula and Testina marinata all’aceto balsamico di Modena for antipasto. Basilica Sant’Ambrogio. Photo by Andrea Stefanini. 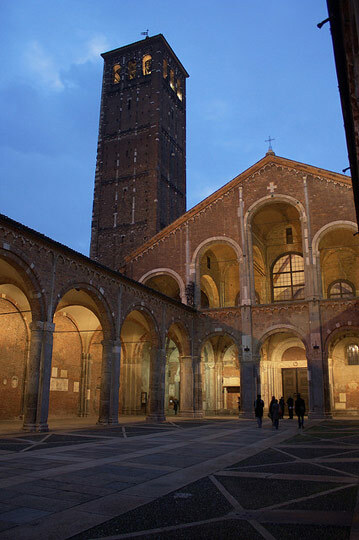 Even though often overlooked, Sant’Ambrogio is one of the city’s most distinctive landmarks and one of the oldest churches of the city. Dedicated to the city’s patron saint the Lombard Romanesque church was built in 379 AD and became the final resting place of St Ambrose in 397. It was extensively rebuilt in the 9th and 10th centuries. The Altare d’Oro is a masterpiece of goldsmithery dating back to the Carolingian period, featuring stories of Christ and St Ambrose. Perhaps one of Italy’s best known cultural landmarks abroad, La Scala was inaugurated in 1778 and has been the opening venue for many famous operas ever since. The audiences of La Scala are notoriously very critical and very vocal. It is not unusual for an artist to be booed off the stage when his performance is not judged up to par. Originally known as Nuovo Regio Ducale Teatro alla Scala after the previous Regio Ducale theater was destroyed by a fire in 1776. Note that the name of the theater indirectly stems from the surname della Scala. Indeed, the theater takes its name from the 14th century church Santa Maria alla Scala that was demolished in 1776 to leave room for the opera building, a church that was named after Beatrice Regina della Scala, who commissioned the church.